I have travelled back and forth from Manila to Butuan multiple times this year and mind you this is the most frequent I have been home since I started to be independent! All these frequent travel deserves some frequent flier miles - hence I signed up for Getgo. GetGo is the newest lifestyle rewards program that gives you free flights just by flying Cebu Pacific and from your everyday spend. The program provides our loyal members points through various ways, wherein these can be used to buy free flights and add-ons in Cebu Pacific. Now that Unionbank is involved, accumulating points has reached peak level. Using the cards for shopping, paying your bills and whatnot can easily turn into GetGo points which you can redeem as free tickets in the future. The more you use your card, the more points you can earn! How crazy is that?! If you are not a member of GetGo yet, sign-up here. Remember my card addiction? If you are a new reader, check my previous post about my ever reliable Globe Beep Card taking me to places near and far, how about my penchant for food with my Gourmet Society card and my almost credit card - PayMaya. Then I saw this ad and of course, I had to have one! I applied online and got word after what seemed like a few weeks that I can now claim the card at the nearest Unionbank branch. I got them and they look very pretty! Since I applied for the Debit Card, a Php500 upfront payment is required and this will be automatically debited every year. 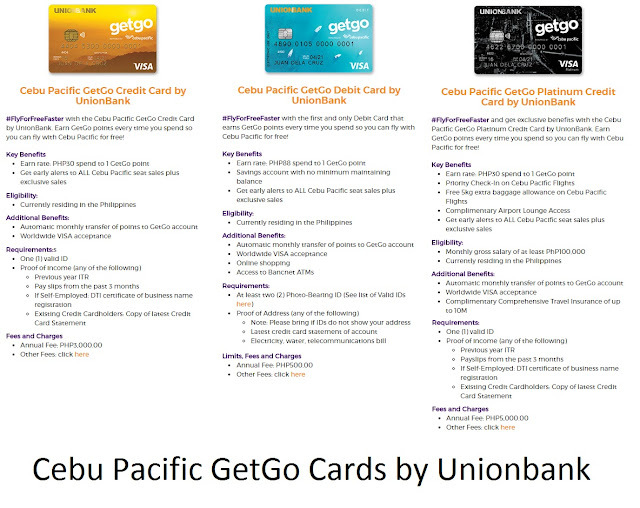 There are 3 variants for the Unionbank Cebu Pacific GetGo cards to choose from. Check out the details below. Interested to get one now? Click this link to apply. Learn more about the cards here.